With the draft in the coming weeks, and much of the free agency action abated, it’s time to look at some storylines for an AFC West division that largely disappointed in 2017. In this article we look at one question facing each of the four teams heading into the 2018 season. Can the Broncos defense regain its Super Bowl form? While the Broncos were still a top 10 defense a season ago in our rating system, and were third in yards per play allowed, they fell to 27th in the unstable stat of turnovers forced per possession and were unable to overcome poor play on offense and special teams the way they were in previous two years. Their 5-11 record marked their first losing season since 2010. Fast forward to 2018 and gone is one of the best cornerbacks of his era in Aqib Talib (fourth and third among cornerbacks in yards per coverage snap in 2016 and 2017, respectively), who was traded to the Los Angeles Rams for a fifth-round pick. While former first-round pick Bradley Roby (12 pass breakups in 2017) and star inside-outside player Chris Harris (76.6 passer rating allowed) return to form a solid pair of cornerbacks, the NFL is a sub-package league, and substantial questions remain regarding who their third cornerback will be in 2018. Speaking of sub packages, one under-the-radar acquisition this offseason was Denver’s trade for former Washington safety/linebacker Su’a Cravens, who played very well in a role similar to what T.J. Ward played for Denver in his first year there (2016). Cravens generated 13 stops, nine total pressures and allowed only a 73.1 passer rating into his coverage in 294 snaps. If he can give the Broncos a boost in the middle of their defense to go along with what Von Miller (95.0) and Shaq Barrett (82.1) can provide on the edge, it’s possible that Denver can have enough success defensively to give new signal-caller Case Keenum the type of environment he enjoyed during his breakout 2017 season in Minnesota. What should we expect from Patrick Mahomes? 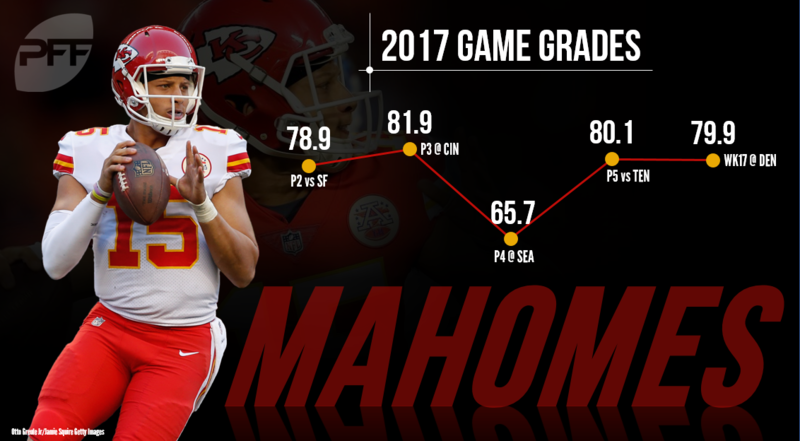 As we talked about on the PFF Forecast, the Chiefs moved boldly last April to acquire Patrick Mahomes with the 10th (and the 27th, 91st and this year’s 22nd) pick. In what rarely happens in today’s NFL, the former Texas Tech star was able to sit for an entire season, playing (and winning) only in a meaningless season finale in Denver against the Broncos. There were concerns over whether Mahomes collection of throws at the college level would translate to those that are more-frequently seen in the NFL. These concerns were statistically legitimate, as our NFL Throws algorithm suggested that nearly 60 percent of Mahomes’ throws in his final college season were not considered “NFL Throws.” However, when asked to make throws that translate to the next level, he graded positively in each throw category, suggesting the Air Raid system was simply requiring less of him rather than hiding any deficiencies in his game. To the Chiefs’ credit, there will be no excuses for Mahomes in Year 1. After acquiring Sammy Watkins in free agency, the Chiefs have one of the best supporting casts in the league for the youngster. They have Watkins, Tyreek Hill (first among receivers in deep receiving yards in 2017), Travis Kelce (first in deep receiving yards and yards after the catch among tight ends), Kareem Hunt (the 2017 NFL rushing champion) and an offensive line ranked in the top 10 in pass-blocking efficiency last year. While Kansas City’s defense might rival those that Mahomes had to contend with while at Texas Tech in terms of deficiencies, I’m bullish on his ability to keep the Chiefs in contention for a division they’ve won the past two seasons. 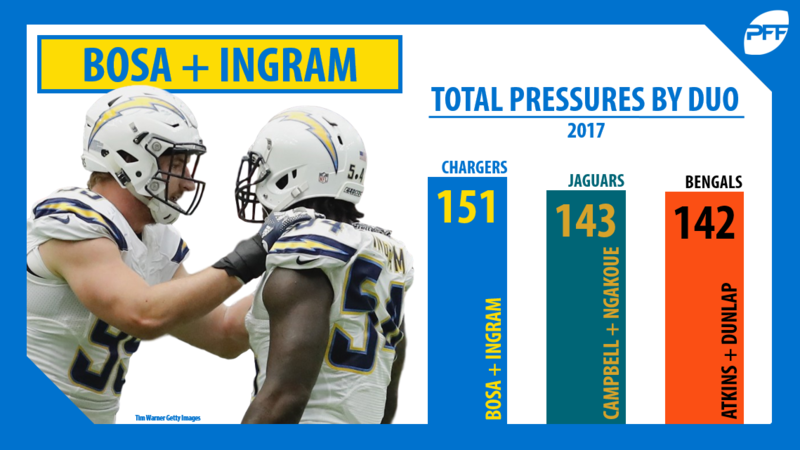 Can the Chargers have the league’s best defense? To improve even more in 2017, they’ll need a healthy return of Jason Verrett (just 323 snaps the last two years) at cornerback, where he earned PFF grades of over 86.0 in 2014 and 2015. If he can play at that level in 2018, the Chargers will have a cornerback room that rivals those of the most-recent Broncos defenses that were able to lead Denver to a Super Bowl win, with a front four rivaling that of the recent Seahawks defensive dynasties (both in talent and scheme). While safety and general athleticism in the middle of their defense are a concern, our latest mock draft has them able to address these issues within the first few rounds, with the expected reversion to the mean of their run-defense going an extra mile as well for the Bolts. If they are to win the AFC West for the first time since 2009, the Chargers will have to compete with Raiders and Chiefs teams that have substantial firepower offensively. Having one of the league’s best defenses, powered by a secondary with the league’s best cornerback and a front seven with one of the best edge duos, might do the trick. Thought of (and paid as) an up-and-coming star in the NFL going into the 2017 season, Raiders quarterback Derek Carr had a poor season, falling into the third tier of our quarterback clustering algorithm. Despite pretty good protection (Oakland’s offensive line third in pass-blocking efficiency in 2017), Carr was just 35th of 41 quarterbacks in generating big-time throws and was 37th in PFF grade earned on third down. While quarterback is the most-important position in all of football, Carr doesn’t deserve all the blame for Oakland’s offense falling out of the top 10 in yards per play in 2017. For one, Carr’s receivers dropped a total of 35 passes, which were the third-most among quarterbacks in 2017, resulting in the league’s third-worst receiving grade (in front of only the Giants and the Bills). Their offensive line, while still good, did fall a couple of percentage points in terms of efficiency in pass protection, and Carr suffered as a result (just a 40.8 passer rating when pressured). Losing Michael Crabtree (20 drops the last two years) might help in the hands department, but his replacement (Jordy Nelson) has certainly lost a step in recent seasons. The addition of Doug Martin from Tampa Bay doesn’t move the needle much in the backfield, either. It might come down to an underwhelming crop of receivers in the draft and/or hopes that new/old head coach Jon Gruden can mold clay in Sean McVay/Jared Goff-type fashion to get the Raiders back to the playoffs for just the third time since he was previously their head coach.